The interest from others on Twitter was pretty incredible, but life and deadlines and general business got in the way and we never quite did the thing. But combine that idea with the fact that I've had Just Mercy on my shelf since the fall--with both Shannon and Shaina urging me to read it--and still haven't read it. The clock is ticking, though, as Stevenson is coming to my town to speak. I've got a ticket, and dammit, I will read this book before he's here. 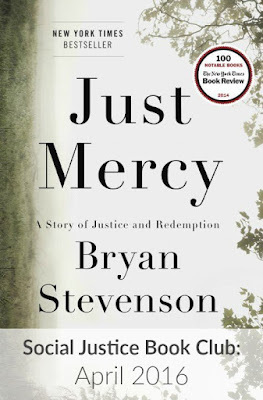 So here's the plan: starting April 1st, I will read Just Mercy. And I will tweet about it and write about it under the auspices of the Social Justice Book Club, using the hashtag #SJBC. 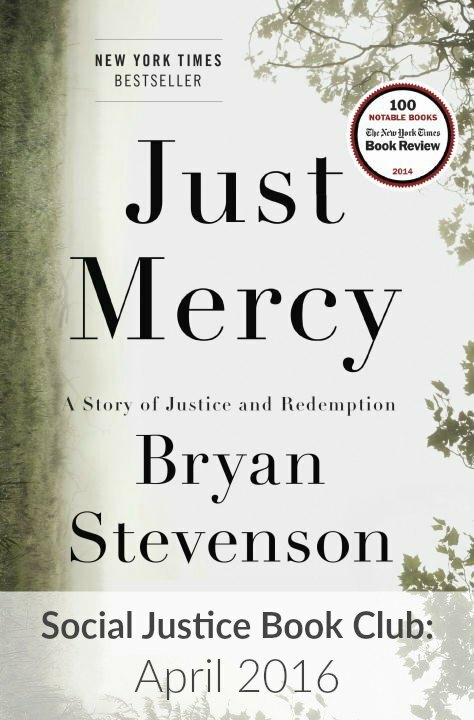 Won't you join us for an April read of Just Mercy? I'm planning to finish by the 20th for Stevenson's talk, but I figure this first iteration of the online book club can run through the end of the month. It'll be very laid back -- post when you want, if you want. No schedules, no chapters assigned, no specific post dates. There's a sign-up form below, so that I (and others) have an idea of who's participating. But no pressure!